If You share this, you may save at least one life. Let's say it's 6: 15 p. m. and you're driving home (alone of course), after an unusually hard day on the job. You're really tired, upset and frustrated. Suddenly, you start experiencing severe pain in your chest that starts to radiate out into your arm and up into your jaw. You are only about five miles from the hospital nearest your home; unfortunately you don't know if you'll be able to make it that far. What can you do? You've been trained in CPR but the guy that taught the course neglected to tell you how to perform it on yourself. Since many people are alone when they suffer a heart attack, this article seemed to be in order. Without help, the person whose heart stops beating properly and who begins to feel faint, has only about 10 seconds left before losing consciousness. However, these victims can help themselves by coughing repeatedly and very vigorously. A deep breath should be taken before each cough. The cough must be deep and prolonged, as when producing sputum from deep inside the chest. And a cough must be repeated about every 2 seconds without let up until help arrives, or until the heart is felt to be beating normally again. Deep breaths get oxygen into the lungs and coughing movements squeeze the heart and keep the blood circulating. The squeezing pressure on the heart also helps it regain normal rhythm. In this way, heart attack victims can get to a hospital. Tell as many other people as possible about this, it could save their lives! Not all cancers are the same. 1/3 is curable. 1/3 is preventable. 1.Smoking is very often the main cause of cancer. It kills us silently and drains money from us quietly. There're 4,000 harmful chemicals (though in diluted form) in one stick of cigarette. Taking one puff is 600 times worse than inhaling exhaust fumes from vehicles. d.Food that is high in fat causes our bile to secrete acid that contains a chemical which is a promoter of cancer cells. e.Food that contains preservatives, too much salt or nitrates, e.g. canned food, salted egg & veggies, sausages, etc. g.Food that is low in fibre : Our body needs 25gm of both soluble & insoluble fibre daily. We must drink at least 1.5 litres of plain water a day. 3.Types of fat and which is the best? a.Olive Oil - It does not absorb in our body. b.Fish Oil - Omega 3 (contained in NI's Circulates) has poly-unsaturated fat. It's good for our brain cells. c.Peanut Oil - It contains Vitamin E. A small dosage is recommended only. a.Vegetable Fat - Palm oil is worse than coconut oil. It is high in cholesterol and highly unsaturated. b.Coconut Oil - It has saturated fat. a.Egg when eaten too much can cause High Colon Cancer, Risk Ovary Cancer, Prostate Cancer. b.Cabbage is highly recommended for health reason. c.Tomato is best eaten raw with a bit of olive oil for better absorption. Other alternative is to take tomato sauce. d.Coffee is good because it contains 2 anti-oxidants. Inhale coffee aroma for half each day is equivalent to eating 2 oranges a day. However, the residue of over-burned coffee is extremely bad for health. It can cause cancer. e.Tea, as long as it is in its original tealeaves and not processed into BOH or Lipton packets, it is good for health. Tea contains 30 anti-oxidants. Recommended dosage is 2-3 cups a day. Have a balanced lifestyle. Exercise regularly. F: Frequency: 3 to 5 times a week. I : Intensity: Exercise till we sweat and breath deeply. Have Regular Check-up. Once we reach the age of 45 & above, it is recommended that we go for regular comprehensive health examination. Early detection may save lives. Nabeez [Nabidh] was one of the drinks consumed by the Holy Prophet (SallaLlahu alaihi wasallam). In his time, it was typically made with dates or raisins and water. It is an alkalizing tonic, having the tendency to remove acidity from the stomach and digestive system and it also helps to remove other metabolic wastes from the body. It improves digestion as it’s high in soluble fiber and it strengthens the memory. It assists the spleen function, liver, throat, chest and prostate, and so is particularly good for men. Nabeez will also benefit patients of Arthritis and elevated levels of Uric Acid (gout). Soak dates overnight in a covered container. You can soak MUNAKA OR GOLDEN RASIN also instead of dates. Remove seeds next day and grind dates with water, you can add honey too. 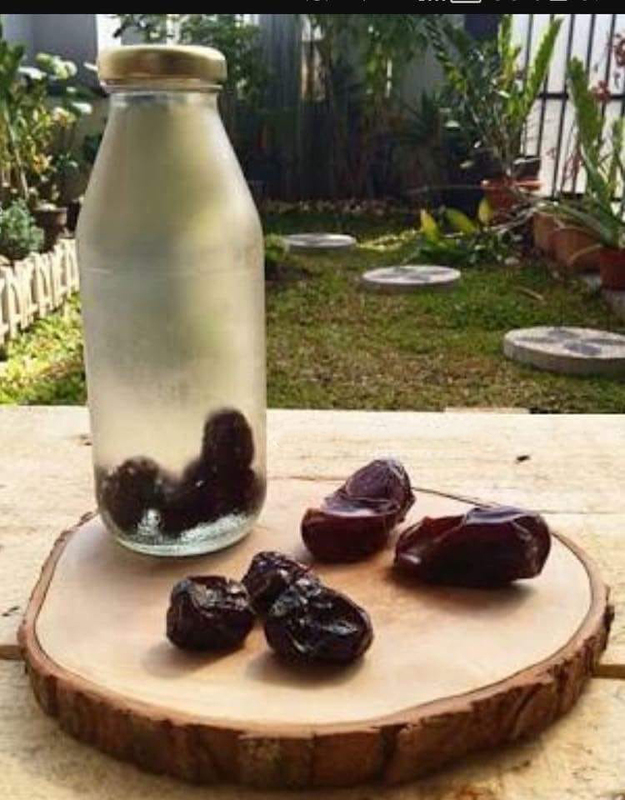 You can drink water without grinding dates. An ideal drink for Ramazan that will boost u. - Why this mistake: Filling the stomach with water is more strenuous to it than with food. - Solution: have a few sips at iftaar then a glass after every two hours. 3. Exercising directly after iftaar. - Why this mistake: the body's blood flow is concentrated around the stomach at that time. - Solution: Exercise after two hours of eating to ease digestion. 4. Chewing and swallowing food fast. - Solution: instead, eat foods that are high in potassium, they retain water and supress your thirst. # Bananas are high in potassium. A banana at Suhoor time can control your thirst level through out the day. # Drinking lots of water at suhoor is important, but not as much as drinking it through out your non-fasting hours. 1. Don't sleep during the day and pray all night. By doing this you are converting the day into night and the night into day, which is not the purpose of fasting. 2. Avoid being lazy and inactive during the day. 3. Don't waste time playing games during the day. Rather, please Allah by increasing in your worship of him. 4. Avoid having Iftar parties. Ramadan wasn't meant to be a food extravaganza. 5. Dont ask and let your mother or wife to spend Ramadan in the Kitchen. Eat something light and quick. Let her also make Du'a n utilize the month of forgiveness. 6. Spend the last 10 days worshipping Allah rather than trying to prepare for Eid! A day that is better than a thousand months is in these last 10 days. You can't afford to miss this. 7. Dont stay awake the full night. Your body has a right over you, and when it wants rest, then rest. 9. Avoid shopping a lot in Ramadhaan. 10. Dont eat the full night. 11. Dont loiter around at night rather than worshipping Allah. 12. Eid doesnt require loads of preparation. Dont fall into this trap! Keep it simple, and it will be blessed.